As per a new report by Transparency Market Research (TMR), the global control valves market is highly competitive. The leading companies, namely, Flowserve Corp., Emerson Electric Co., Metso Plc, and Dresser Inc., could only hold a quarter of this market in 2015, which points towards an extremely fragmented business landscape. Over the coming years, the competitive rivalry between the leading players is expected to increase further, as they are focusing aggressively on product differentiation to gain an edge over their competitor, reports the study. 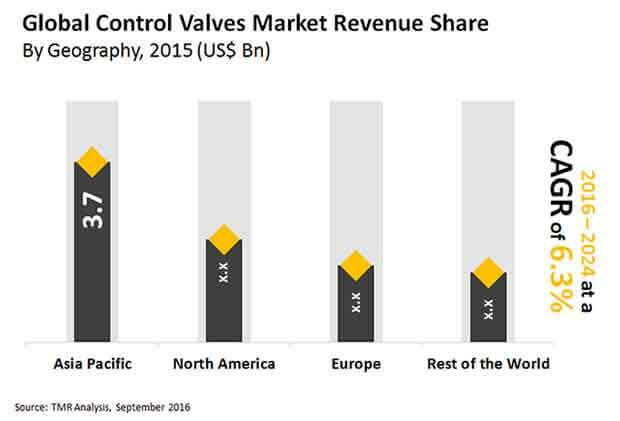 The report estimates the overall opportunity in the global control valves market to increase at a CAGR of 6.30% during the period from 2016 to 2024, rising from US$8.92 bn in 2015 to US$15.41 bn by the end of the forecast period. In terms of volume, the market is likely to report a rise at a CAGR of 5.90% over the same period of time. The demand for butterfly control valves is higher than other types of control valves and the trend is expected to remain so in the near future. The power generation, chemicals, oil and gas, food and beverages, automotive, pharmaceuticals, and wastewater management industries have emerged as the key end users of control valves across the world. According to the research study, the chemicals industry has surfaced as the leading consumer of control valves while the power generation sector has been the key contributor to the market in terms of revenue. The report further has evaluated the worldwide market for control valves on the basis of geography. Asia Pacific, North America, Europe, and the Rest of the world, including South America and the Middle East and Africa have been considered as the main geographical segments of this market in this report. With an ample availability of untapped potential, Asia Pacific has been leading this market and is anticipated to remain doing so over the forecast period, notes the study. “The significant growth of the oil and gas industry is having the most prominent impact on the global market for control valves,” says a TMR analyst. The increasing application of these valves in upstream, midstream, and downstream activities is likely to reflect positively on their sales in the years to come. In addition, the benefits control valve offer to this industry in pressure and temperature control will favor the global market for control valves substantially in the near future. On the other hand, the rising utilization of alternative sources of power may deter the uptake of control valves, which may hamper the growth of this market over the forecast period. Nonetheless, the extensive usage of control valves in the food and beverages industry will aid this market over the next few years, states the research report.